These Choker Slings are designed to grip or choke the load. Ideally suited to lifting bar stock, beams, lumber, bundles of pipe and similar material. The tapered sleeve splice, as well as the anchor hitch, Type 17-9-5, allows close snubbing of load, insuring a positive grip. The use of sliding choker hooks increases sling life and permits faster handling. Rated capacities basket hitch on D/d ration of 25 rated capacities based on pin diameter no larger than rated capacities based on design factor of 5 horizontal sling angles less 30 degrees shall not be used. Note: The above table is applicable to the three Choker Slings that are illustrated. 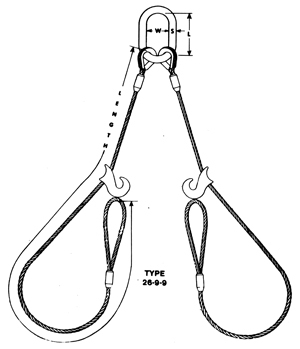 EXAMPLE: For a sling leg choker with sliding choker hook with a rated capacity of 1.1 tons, 6 ft. long, used as illustrated: ORDER: One — 3/8″ diameter Type 15-1-9, 6 ft. long.